Reminder: On Labor Day, Metro buses and trains will be running on a Sunday schedule. Want to reduce your own carbon footprint? Try walking or biking instead of driving or take transit, which generally speaking is more efficient than driving alone. Even if you can only walk, bike or take transit occasionally, it’s something! The article is in response to Metrolink’s announcement on Thursday that it will begin adding leased BNSF locomotives in front of Hyundai Rotem cab cars. The Rotem cars are built to better withstand collisions but Metrolink wants to further evaluate whether plow-like devices at the front of the cars are effective. Metro is one of the five county transportation agencies in Southern California that funds Metrolink. The crux of it: Gov. Jerry Brown supports a new $65 fee for vehicle owners and an increase of six cents to the state gas tax (and 11 cents to the diesel tax). About $500 million would come from the state’s cap-and-trade program. Transit would stand to get $400 million. This proposal does not appear to have the support of the Republican caucuses in both houses. As this proposal is consistent with our Board’s priorities and provides funding opportunities for Metro’s projects and programs, we would urge the Board to communicate support for this proposal especially with members of the Republican caucus in the Senate and Assembly. Will the state Legislature go for it? We’ll see. Raising the federal gas tax has proved to be politically impossible since it was last increased in 1993. Raising the state tax may not be much easier, considering that Californians tend to pay more for less polluting gasoline required by the state. Putting aside the annual legislative wrangling — not to diminish its importance — it’s interesting to see the state’s cap-and-trade program tapped for transit and transpo. According to the LAT, the program raised $969 million in 2014 and is expected to raise about $2 billion in the future. I’m guessing the future tension will be between how much of those funds go to local transit agencies and how much to the state’s bullet train program, which needs tens of billions of dollars in order to build the line between L.A. and S.F. Things to read while sitting/standing/stuck on transit: Hey, it’s Force Friday, i.e. a made-up day to sell a bunch of Star Wars stuff. In that vein, here’s a good read on Wired about BB-8 toys. 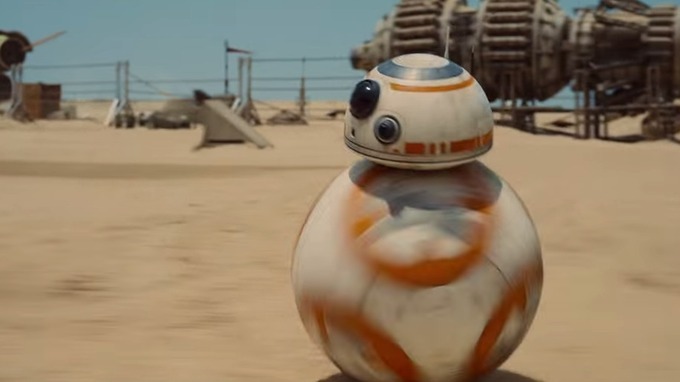 BB-8 as seen in a trailer for “Star Wars: The Force Awakens.” Credit: Lucasfilm/Disney. This provocative post takes aim at the “1099” economy that relies on firms such as Uber hiring independent contractors instead of employees that would be more costly. The problem, says Mom Jones, is that Uber drivers are getting hosed and deserve to make more money. They just might, depending on the outcome of a lawsuit by former drivers. This is dangerous at a time when there is increasingly no such thing as a high-wage, middle-skilled job — the thing that sustained the middle class in the last generation. Now there is only a high-wage, high-skilled job. Every middle-class job today is being pulled up, out or down faster than ever. That is, it either requires more skill or can be done by more people around the world or is being buried — made obsolete — faster than ever. Which is why the goal of education today, argues Wagner, should not be to make every child “college ready” but “innovation ready” — ready to add value to whatever they do. I look around and I’m surprised at how many of my friends and acquaintances are working as contractors in various fields — some by choice, some because the jobs have dried up. I’ve certainly spent a healthy slice of my career as a contractor. Most everyone I know says it’s a mixed bag: definitely more freedom, definitely more self-employment taxes and health-care costs and definitely more uncertainty. As someone who still hasn’t managed to use Uber, I’ll say this: I have plenty of friends who do and what they like is that it’s cheap. The disconnect, of course, is that their cheap ride trickles down and has a real impact on others. Ummm….if you haven’t ridden on Uber or Lyft, or let alone been an “independent contractor” for Uber or Lyft, then you can’t really give an objective opinion about it. How do you know for sure that “their cheap ride trickles down and has a real impact on others” when you haven’t ridden on one or driven as an independent contractor for Uber or Lyft yourself? Hearsay and conjecture? Because that’s what you think? Isn’t being a journalist not based on opinions but based on independent research and facts? Then this is not journalism, it’s just an opinion piece. It’s a baseless opinion from a third person without actually trying it yourself, spoken like a hypocrite who assumes that it is the case but never tries it out to see if that is the case themselves. Before making opinions like this, perhaps you should ride Uber and Lyft first. Try it out and see what this whole rideshare thing that the Millennials love so much, the one that’s giving politicians headaches because this whole genre of using technology to hail a cab-like ride is pitting two of their major constituents against each other: the unions and the Millennials. And if you have a car that you could spare for few hours, maybe you should also look at the different perspective of driving as an independent contractor for Uber and Lyft and see what it’s like to drive one and if see if what you say is true. Uber and Lyft has no set hours so you could sign up as a driver for Uber or Lyft, try it out for 2-3 hours as a driver on a weekend and see if that is what you think. Plus, you could be making extra $$$ on the side as you’re doing the investigation. Do this first and then come back with your findings. You can’t comment on something that you know nothing about. Yeah, Steve, don’t you dare write another article disparaging this greedy corporation until you spend some of your money to support their unsustainable, anti-labor practices. And while we’re at it, don’t say another word about the health effects of smoking until you light up and smoke a pack yourself! Strawman argument. Typical liberal argument, if you can’t argue something on a logical level, use totally unrelated examples to prove your point. You have scientists and researchers, the data and all the scientific evidence backing up the claim the smoking kills. Nothing substantiates that Uber and Lyft are evil corporations that sells deadly products like Phillip Morris or R.J. Reynolds. PErhaps we should ban and fine Clorox, SC Johnson, Proctor & Gamble for selling bleach and ammonia which can cause deadly nerve gas when mixed? Should we say Apple and Google and all the computer companies are evil corporations too because they use slave labor in China and third world countries to make our smartphones and our laptops and computer equipment? Yet oddly, I don’t see many going against them, and by the sheer fact that you’re posting here already states that you already are a consumer of slave labor products. You’re not seeing the bigger picture. Uber makes more money doing cheap, short trips many times than one long trip. Uber takes a 20% of the fare no matter how long or short. One long drive of $10 in an hour, which could be the case when someone is stuck in horrible LA traffic, Uber only gets $2 in an hour, driver only gets $8 an hour. Five short drives of $4 in an hour, Uber gets $4 in an hour, the driver makes $16 in an hour. They actually make more money by doing shorter trips more frequently. And I’m sure Uber already knows what everyone here already knows: the vast majority of people in LA do shorter trips than long ones. Multiply that by the number of drivers at any given time and Uber just proves what all the other successful transit fare systems that is used outside the US are using: distance based fares, many people doing shorter trips that cost less. An Uber car that just drives up and down a street and people get $1 off for hopping on and off at that particular route. Sounds awfully like a bus to me. But it’s a bus-like service that runs on distance based fares, something that public transit agencies in the US oddly refuses to do despite the technology available today. And how do you know this? Do you have some magical data that only you know that Google searches cannot yield? I put in the search terms “lyft driven out of market” in Google and I see no data that vilifies your claims. I see one article that says “Why The Downfall Of Lyft Is Imminent” dating back to Sep 2014, but I still see plenty of Lyft drivers in my area just by firing up my app. I definitely understand that short trips are more profitable for both the driver and Uber, and never claimed otherwise. I never attacked distance based fares either. The trip I was referencing was actually a 13-16 minute drive depending on traffic, and I had been paying a mere $4.10-$4.60 for it (which is an absurdly low price). I was merely implying that Uber is doing what nearly every big business with a smaller competitor (lyft) would do: gouging their prices to obtain new riders (or have riders leave lyft and come to them) and then over time raising prices back to what the market rate actually is. Uber is an excellent service, and I applaud and support the idea of ridersharing and utilizing technology to increase mobility. But I am also not blind to the fact that like many businesses, they are complicit in some pretty crappy things. Travel time is an useless variable in LA due to street traffic conditions; one could be going only 5 miles for 13-16 minutes or one could also be going 20 miles in light traffic as well. Heck during a Dodgers game, it can take well over an hour of ride just to get out of the parking lot and onto a freeway. It can take 30 minutes just to make the loop in World Way at LAX at heavy hours. Do your math. Would you rather be spending $100 in monthly passes forever (no guarantee that it’ll remain at that rate) or just buy a $200 hoverboard like contraption for your short travel needs? Mother Jones is the opposite end of Fox News, just as biased but on the left side. You decide which has done their research more, a person writing an article who never tried Uber or Lyft, or a in-depth review like this where they actually rode on Uber and Lyft vehicles and interviewed the drivers themselves on how they think it is to be an Uber or Lyft driver. I say we just kick out the incumbent Democrats out of Sacramento. We already pay the nation’s highest gas taxes and our auto registration fees are high enough as it is already and they want to increase it more? How about slimming down government, reforming CalPERs and laying off bunch of useless government employees? Democrats: tax, tax, tax, spend, spend, spend, fiscal irresponsibility. CA used to be great, now it’s just a hell hole of liberals.